Take your break to the next level! Explore Israel on an enriching adventure & get the most out of your 10 days by traveling with Israelis your own age & other students from schools through New England for the whole experience. 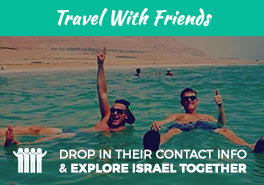 Explore Israel on this classic trip customized for you! What’s stopping you? Now is the time to take this immersive journey & discover the land, history, culture, food, scenes, sites, cities, & so much more on this experience with Shorashim & JNF! "I loved Shorashim because it explores who you are. I believe that I found myself more in Israel than I have ever felt in my life. I continue to treasure my memories and my friends."